Note:The treadmill motor for the DC motor, running more smoothly, every time the usage of a treadmill for 45 minutes or 1 hour, want to rest for 15 minutes, in order that the motor cooling. Silicone oil once a month, every time add one third, and both sides must be added. This silicone oil is environmentally friendly materials, no pollution. Add silicone oil to lubricate the treadmill. 【SPACE SAVING &EASY-SELF LUBRICATION】 : Free installation! Has been assembled and folded, just want to put the screws on.Easiest size and folding design great for home use and comprises rolling wheels at the bottom providing simple transport. there’s a quick service refuling button, just add lubricant at the hole and let the treadmill run itself at the maximum speed for a while. And it’s going to dispense it routinely. 【0.5-9.2 MPH Speed levels & P01-P12 Programs 】With 0.5 to 9.2 MPH Speed levels to be had, you’ll choose different speed base for your physical condition and exercise based. There are also 12 programs to be had for you to select, these easy-to-use exercise programs assist to reinforce your cardiovascular fitness, spice up your health, and burn fat. 【Multi-Function Display】Keep track multi-display console,Displays :heart rate, speed, calorie,time, distance, mode, keep track of your performance and monitor your progress. Built in MP3 connectivity and hi-fi stereo system mean you can enjoy music as you run. 【Safety Design and Cushioning Design】Safety Key connect you and the machine, emergency stop button at the handrail, which double offer protection to you even as figuring out. 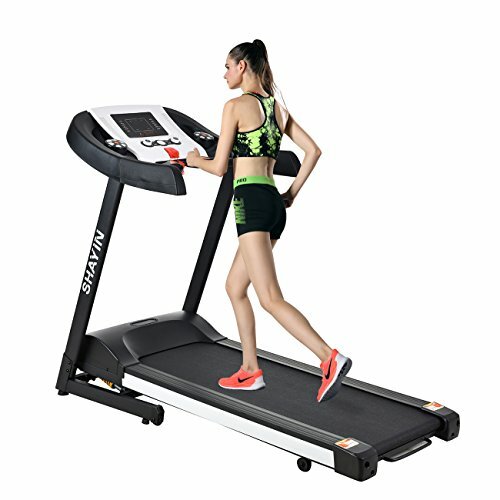 Cushioning design on both side of treadmill will reduce noise and descrese vibration on your floor, provide you best possible and moderately workout experience.